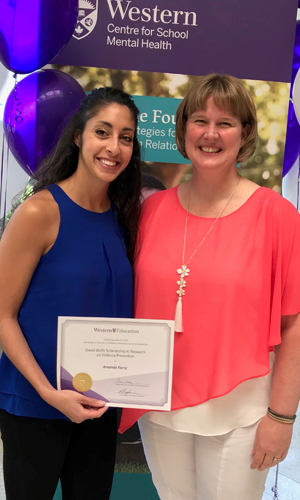 Congratulations Amanda Kerry, recipient of the 2018 David Wolfe Scholarship in Research on Violence Prevention. Amanda is a year three PhD student in the School & Applied Child Psychology program at the Faculty of Education. Through her clinical experiences at the MA and PhD level, Amanda has honed her focus in furthering the work of preventing domestic violence and other forms of interpersonal violence. With previous experiences in corrections, child and mother support, and therapy for men who engaged in abusive behaviours, this has led Amanda most recently in her doctoral studies to implement and adapt the Fourth R Health Relationships Plus Program (HRPP), a small groups program targeting violence prevention and healthy relationships, in the youth justice system. Her research is specifically examining the feasibility and fit of the adapted HRPP program to better meet the needs of youth offenders and fit the constraints of a correctional setting. Amanda’s passion and focus in this work will allow her to continuously make meaningful contributions to the field and conversations on relational violence, just as Dr. David Wolfe did. This scholarship is awarded annually to a graduate student in the Faculty of Education based on research on violence prevention and student well-being in schools, as well as academic achievement. The award is determined annually by an adjudication committee that select recipients based on merit according to the award terms. Dr. David Wolfe is a Senior Research Scholar and Professor with the Centre for Research and Education on Violence Against Women and Children at the Faculty of Education at Western University. He held the inaugural RBC Chair in Children’s Mental Health from 2002 to 2012 and served as Editor-in-Chief of Child Abuse & Neglect: The International Journal from 2007 to 2012. Dr. Wolfe is a fellow of the American Psychological Association, past President of Division 37 (Child, Youth, and Family Services), and received a Diplomate in Clinical Psychology from the American Board of Professional Psychology (ABPP). He is a recipient of the Donald O. Hebb Award for Distinguished Contributions to Psychology as a Science from the Canadian Psychological Association and the Blanche L. Ittleson Award for Outstanding Achievement in the Delivery of Children’s Services and the Promotion of Children’s Mental Health from the American Orthopsychiatry Association. He has provided extensive assessment and consultation to child protective services, schools, and the courts with respect to issues of child abuse and violence. Congratulations Amanda on winning this distinguished award.